On November 7, 2018, following a Quilts of Valor Award Ceremony at the State Library, please join us for a Quilts of Valor Sew Day Workshop. 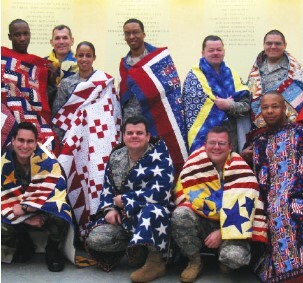 This workshop includes a quilt making demonstration by volunteers from the South Carolina Chapter of the Quilts of Valor Foundation who will share and demonstrate how they create quilts that are awarded to South Carolina Veterans. All are welcome to drop by between 11:00 and 2:00 p.m. on November 7, 2018. This program is FREE and open to the public. This program will be held at the South Carolina State Library, 1500 Senate Street, Columbia. Please visit our map & directions page or call (803) 734-8666 for parking information. For more information, please contact Virginia Pierce at (803) 734-8646 or vpierce@statelibrary.sc.gov.